-A mountain lion was wandering around downtown Santa Monica. -A single-engined plane crashed into suburban Glendale. -A $50,000 reward was offered for anyone who has information about a double hit-and-run that fatally killed a 79 year old woman from Pacoima. And that terrifying news trifecta made me stop texting my husband, grip the steering wheel with both hands, and take in my surroundings as if at any moment destruction could be hurled into my path. I'll be honest, I was okay with his chess-playing ways. I trusted that his bald eagle emblazoned plate was pretty dog gone full. I mean, his to do list from the outset was enough to make most people curl up into a ball and take a nap for four years. I didn't need nor expect him to take the pro stance until well into his second term. 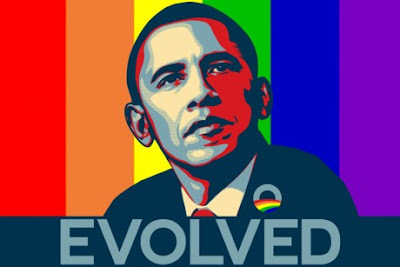 But President Obama's announcement last week that he is now in support of gay marriage caught in my throat and brought tears to my eyes in a way I could not have anticipated. A sitting president of the United States has finally supported not only homomony, but also my own personal lifestyle, my marriage, my children and...in a word...me. Boy howdy, I cried like Sherri Shepherd after she was kicked off of Dancing with the Stars. 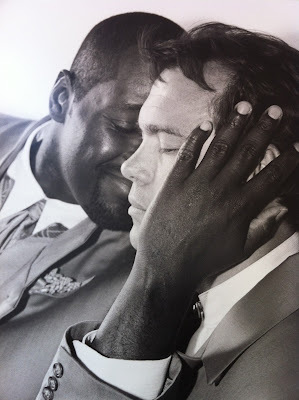 Eleven years ago today I married my husband. It wasn't a legal marriage, in the sense that it was not recognized by the government. However, we did get married in a church, and I defy anyone to tell me our wedding wasn't recognized by a much higher power. What a day. I think of all the planning that went into it. Typical list: the church, the reception, the dinner, the invitations, the flowers (blue hydrangeas), the photographer (Tracey Landworthshe's brilliant, check out her link), the wardrobe, the band (Eddie Watkins Jr & The Go Big Daddy Band, also stupendous), the seating arrangements, the cake, the open bar, the 150 guests, and our biggest splurge, the white chocolate place cards. Our families arrived before the ceremony to take pictures. This one is just brimming with racial harmony! To the thick of it then... Thank you so much for what you have given Sebastian, and in turn my family. Your talents at directing are immeasurable, and I don't use that word lightly. Working was an absolute hit, and to see all those children up on stage, not only giving it their all, but also showing various levels of stage proficiency was mind blowing performance after performance.